Your eyes registered the world with perfect clarity for decades -- but now that you've reached middle age, you seem to be seeing odd occasional shadows, "blobs" or points of light drifting across your field of vision. But that doesn't mean you should fly into a panic and rush yourself to an emergency room. The phenomena you're experiencing, commonly referred to as floaters and flashes, are actually quite common and harmless, although they can sometimes indicate an underlying eye problem that merits attention. 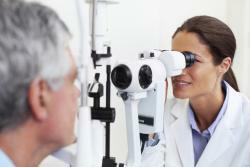 Our eye doctors at Maple Ridge Eye Care can settle the question with a simple examination. Floaters typically manifest themselves as dark shapes or spots that appear to move slowly and aimless in front of the eye. But the truth is that all the action is occurringinside it. A floater is actually a tiny bit of the vitreous, a gel-like material that fills the inside of the eye and helps maintain the eye's characteristic spherical shape. The vitreous is filled with fibers that anchor it to the retina, the light-detecting inner lining of the eye. As the eye ages, the vitreous can start to shrink, and sometimes a fiber will break away and go floating free inside the eye. When the fibers cast shadows across the retina, you see floaters. Most floaters are quite small, but occasionally you might see a larger c-shaped, J-shaped or doughnut-shaped floater known as a Weiss ring. Flashes are also related to the normal age-related shrinkage of the vitreous. The tugging of a vitreous fiber on the retina can produce a nerve reaction that simulates a flash of light. Flashes may resemble sparks, bolt of lightning or stars (hence the term "seeing stars"). Normal age-related flashes and floaters are nothing to worry about. You may be more prone to them if you are 50 or older, nearsighted, have experienced eye trauma or cataract surgery, or suffer from a condition called diabetic retinopathy. You may even have been seeing them for years without noticing them. However, if you suddenly experience a large, sudden burst of severe floaters and flashes, you need to have your eyes examined immediately. In some cases, these symptoms indicate that the retina has been torn or detached, a problem that requires prompt treatment. Ordinary floaters and flashes will usually fade away (or come and go) without any need for specific eye care measures. The best way to put your mind at rest about these strange visitors to your field of vision is to schedule an eye health exam at Maple Ridge Eye Care. Our optometrist in Maple Ridge and Pitt Meadows can dilate your pupils to get a detailed look at your retina. Our eye doctor can tell right away whether there is any damage to the retina, at which point they will recommend the appropriate treatment. Contact our clinic with any questions!